The Group classes are the staple of CrossFit 557 programming and run most of the day. Each class will include a warm up, mobility, a strength and/or skill, and a metcon (WOD). The WOD is our staple because every part is completely scalable from beginners to competitors. The daily challenge will be completely personal as everyone has different fitness goals. Coaches will be there to help demo and break down movements, push and encourage when needed, and hold you to the 557 standards. These sessions are 1-hour. An adapted CrossFit class with emphasis on core strength, functional mobility, balance, coordination, and fluency of movement. CrossFit equipment will be used with movements modified as needed, on an individual basis. Individual and group activities will be led. Link goes live (4/15/19) for our Summer Adaptive Course. 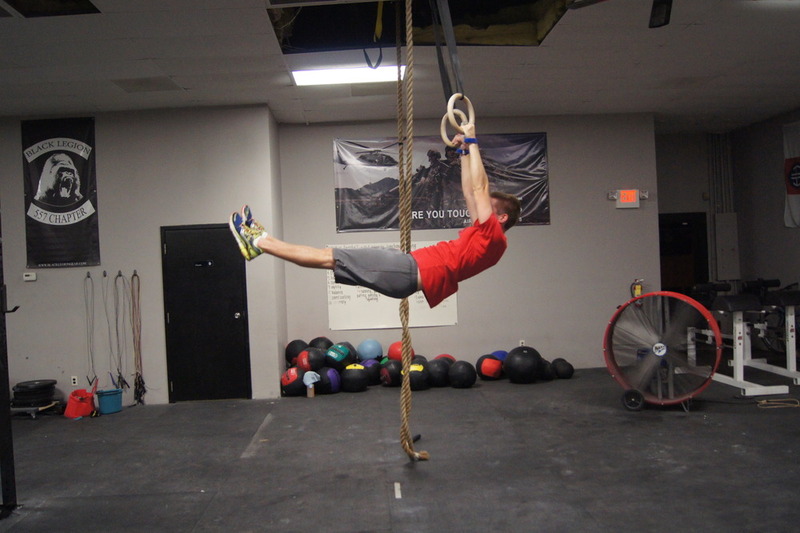 Gymnastics in CrossFit are one of the three categories that we focus on. These movements range anywhere from a hollow body to muscle ups. These classes are intended for anyone from beginner to competitor. The gymnastics class will help to either build or improve on your gymnastics foundation. We work through movement focus cycles in order to help members see results while still going over an array of gymnastic movements. For each movement there will be broken down levels for progressions based on a member's current skill level. This allows the beginner and competitor to work the same movement in a different way based on the needs of the athlete. These sessions are 90 minute sessions. Sign up for our next cycle. Olympic lifting has becoming more popular with the influence of CrossFit. These classes are not for the beginner and are intended improve technique, strength and explosiveness during the Olympic Lifts. These classes will be led by Jeff Papenburg and run in cycles with a focus on a certain movement. This allows members to learn all of the Olympic Lifts while have a specific cycle of work to focus on and improve skills. These sessions are 2-hours. Ready to take your skills to the next level. Come train with some of the best athletes of the midwest. To compete in CrossFit, athletes need to be well rounded or have a good GPP (General Physical Preparedness). To compete at a high level takes dedication, focus and the willingness to work hard day in and day out. These classes consist of a high volume of training and can last anywhere from 90 minutes to 2 hours. We assume that anyone wishing to join in competitors program is looking to compete a few times a year. *Acceptance to these classes is up to the coaching staff and has a clear set of pre-requisites. Sign up here if you're ready for the next level. Our high school classes are focused for high school aged athletes looking to develop or increase strength, speed, agility and explosiveness. All of our coaches at 557 played collegiate sports and know what it takes to get to the next level. We focus on overall fitness and strength while touching on sport specific movements to maximize results. These sessions can be in personal or group settings and will last 1-hour. Click here to learn more about sport specific training for Teens. At CrossFit 557 we want to help you achieve your fitness goals, and sometimes that means putting in a little extra work. We offer 1 on 1 training based on the coaches available time. If you're looking to improve a certain skill or just get better all around and you need some more personalized time then this is for you. We'll sit down and talk with you about who would be your best fit for your goals and make sure you're headed in the right direction. These sessions will be based on time needed and availability and price will change based on the trainer chosen. Learn more about our Personal Training.